Trills, Tweedlies, and Turns, Oh My! 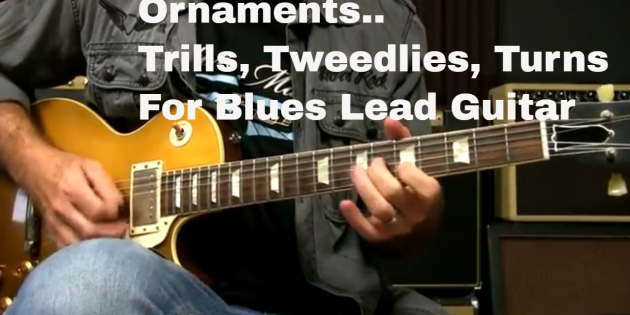 And while this ain’t classical music by any means, these ornaments are still pretty darn cool, and worth your time to start mastering. If you can get these down, you can take even the simplest of idea and make it sound way cooler! Great lesson as always, Griff. I have a question please. In the Turnaround you used a slide instead of the usual hammer-on/pull – off in one of your examples. Is there any benefit or reason for using a slide instead of the hammer-on /pull-off? I’ve seen quite a few guys using the slide up and back 1 fret recently and wondered about the reasoning behind doing this. Aston Martin Vantage T-shirt? Nice car, and a bit of a change from your usual music-themed shirts, Griff. And is this the first time we’ve seen the Gold-Top Les Paul? Cool lesson. Hi Griff, maybe I missed this but does the turn use a note that is not in the scale “officially”? Since it is only a 1/2 step, is that what makes it a turn? Yes, very cool! and yes, I did dug it. Good advice. Thanks for the lesson Griff. Great video, always so informative. Could you include the tab for the turn around. I’ll have to watch it a few times to understand that, but overall I really dig this lesson. Thanks! Is there any other kind of string besides EB Slinks? You were right on everything except the spelling. Its mordente. Griff , this is a big help to me to add a little “pizazz ” to a riff . I have been using the trill , but this really sounds great . Thanks for this great lesson . Mike Z. Does anyone know what strings Griff uses on this Les Paul? Historically, Griff uses Ernie Ball Slinkys, usually .010 (EB item number 2221). Lloyd is correct. Been using them for many years. Excellent, excellent, excellent. Clear, concise and straight to the point.